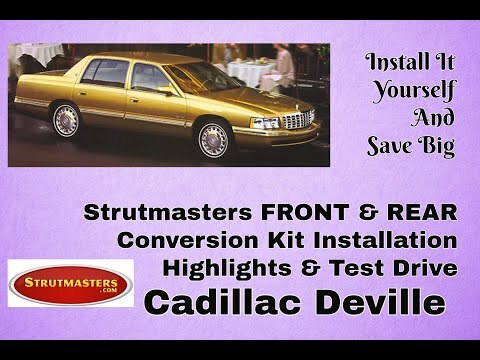 Strutmasters 1994-1995 Cadillac Deville 4 Wheel Air Suspension Conversion Kit is the perfect solution to your air suspension problems. Designed to be very affordable, you can convert your air suspension to use standard shocks/struts and coil springs for less than the price of replacing one air strut. 1994-1995 Cadillac Deville 4.9L Deluxe 4 Wheel Air Suspension Conversion Kit With Relay (CD34FP) is the perfect solution to your air suspension problems. Designed to be very affordable, you can convert your air suspension to use standard. 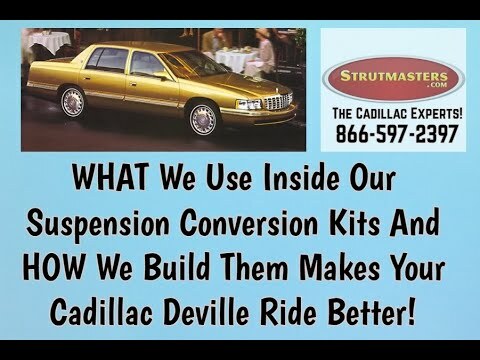 Strutmasters' air to non-air suspension conversion kit saves Cadillac Deville owners time, frustration, and money when the original air suspension system goes bad. This coilover conversion kit eliminates the faulty electrical components of the original system. Made in the USA, the kit comes complete with two pre-assembled front struts with premium springs, two premium rear coilover shock absorbers, and two premium Eibach coil springs. The quality parts are guaranteed by Strutmasters' Lifetime Limited Warranty. Car enthusiasts appreciate that the kit is installed easily, in about one hour per wheel. Each kit comes with detailed instructions and online installation videos. If further assistance is needed, Strutmasters' ASE certified experts provide technical support over the phone. At a fraction of the cost of dealership direct replacement, this kit saves customers a considerable amount of money. 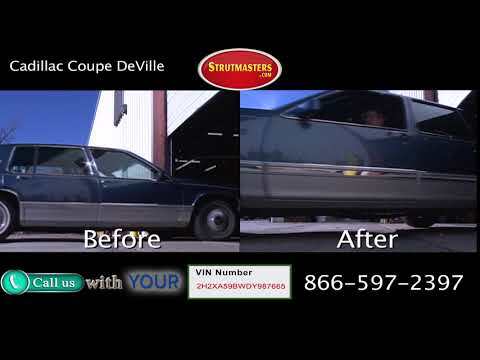 How Do I know If My Deville 4.9L Air Suspension is failing? Look for the following signs that indicate the air suspension system on the 1994-1995 Cadillac Deville is leaking or going bad. Early detection of a failed suspension system is critical to maintaining the overall health of the vehicle. One major red flag is the Deville's inability to maintain its proper ride height. The next sign to look for is any sudden height variance between different sides of the vehicle. One end may sag while the opposite end remains inflated. There may be a shifting lean from side to side. Some drivers describe the Deville as ‚Äúsquatting down‚Äù in the rear. These imbalances must be fixed promptly, or the air compressor will wear out. Once suspension failure is advanced, a suspension warning light will illuminate on the dashboard. At this late stage, an expensive repair is unavoidable. 1994-1995 Cadillac Deville Electronic Struts (x2)- a type of shock absorber; has metal tubing filled with gas-charged hydraulic fluid that is connected to the wheel of a vehicle in order to reduce the effects of vertical travel on a rough surface which controls the bounciness, and therefore comfort, of a vehicle. 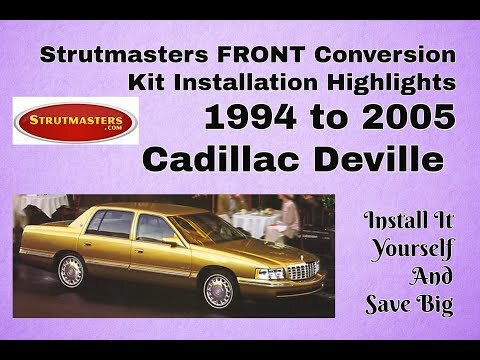 The Cadillac Deville√¢¬Ä¬ôs struts, while having coil-springs, use an electronic signal to stiffen or soften the dampening of the strut. 1994-1995 Cadillac Deville Shock Absorbers (x2)- a metal tubing filled with gas-charged hydraulic fluid that is connected to the wheel of a vehicle in order to reduce the effects of vertical travel on a rough surface which controls the bounciness, and therefore comfort, of a vehicle shock absorbers. 1994-1995 Cadillac Deville Coil Springs (x2)- Coil springs hold the vehicle up but be careful, they are rated for and designed to work with the rest of the suspension system, so when you change air shocks to passive shocks, then you will need a different rated coil spring that works well with the new type of shocks. 1994-1995 Cadillac Deville Air Lines- tubes that run from a compressor (air suspension) to the air struts which carry pressurized air to the air bags components in order to adjust the height of the vehicle, respectively. 1994-1995 Cadillac Deville Solenoids (x4)- usually L-shaped, these plastic components connect the electrical connection and lines of suspension components to the suspension control module on vehicles with active suspension. The solenoid regulates the air pressure for each air spring. Solenoids start to leak as they wear out causing the vehicle to sag or to lean. This will cause the ride height sensor to send a signal to activate the compressor in an attempt to inflate the air suspension and level out the vehicle. This excessive work load will eventually lead to total failure of the compressor. 1994-1995 Cadillac Deville Compressor- creates/sends pressurized to active suspension components. When the air suspension starts leaking, the compressor/pump starts working harder to try to keep the system inflated. By the time air suspension leaks down completely, sitting the vehicle on its tires, the compressor will either have failed or be well on its way to full failure. Buying replacement struts and taking the time to install them only to find out the compressor still needs to be replaced can be very frustrating, time-consuming, and expensive. 1994-1995 Cadillac Deville Dryer Assembly- used to keep moisture out of air lines and air springs in order to prevent freezing and internal cracking of these parts. Once air suspension starts leaking, moisture will build-up throughout the air system. Moisture damages the air suspension from the inside. The dryer will need to be replaced in order to eliminate the moisture and prevent any further damage. 1994-1995 Cadillac Deville Suspension Control Module- a computer which is responsible for the operations of the air suspension system and maintaining the vehicle√¢¬Ä¬ôs correct ride height. 1994-1995 Cadillac Deville O-rings- Although they are the least expensive parts of the air suspension, they are responsible for maintaining the seal where all of the air lines connect. Be sure to replace the O-rings when repairing any air suspension system. “The “”check SSS”” light on my ’94 DeVille came on to stay recently. The ride on the Cadillac was starting to get a bit “”mushy”” so it was time to have the suspension checked out. The adjustable components of the system were showing signs of breakdown. After searching, STRUTMASTERS looked like the solution. The staff at the shop were all very professional and knowledgeable. They know suspensions! After some consultation, I took the Caddy up to the Roxboro plant to have the original shocks replaced with the Strutmasters kit. Now I am back to cruising the highway in Cadillac comfort. For less than the cost of replacing one of the failing OEM struts the pros at Strutmasters installed their kit on front and rear. With only 103,000 miles on the old girl, I think there will be plenty more miles of travel together.